I am a Mumbaikar by my soul and spirit. Having stayed in Pune for little over a decade now, I may have got attuned to Pune and its lifestyle but the deeply ingrained spirit of Mumbai is still alive within me. This flame gets rekindled every time I find a mention of food items- that Mumbai is well known for- in the foodie circles, groups and communities which I am part of. Quite recently a contest was announced on a Facebook Group- खादाड खाऊ – Khadad khau that I am part of. Now, if you have been a part of any such foodie communities, groups for any stretch of time, you would be well-aware how these different contests keep occurring every now and then. While I would get excited by these contests during my initial days of blogging, I realized later how these contests result into my schedule getting altered in unexpected ways and which is not always worth it. However, this time was different. The contest was about Pav Bhajis- different ways in which each of us make Pav Bhajis at our home. As I read those two words-Pav Bhaji – I could feel myself going weak in my knees. My deep rooted love for Pav Bhaji and Mumbai came to fore. I was struck by a sudden bout of nostalgia- numerous food excursions that me and my friends undertook to different food stalls in Mumbai with the only real intent of indulging in riot of flavors that this dish was- Pav Bhaji. I felt that sudden and immense urge of reliving those fond memories one more time. For the contest, I didn’t want to make a Pav Bhaji that we all are used to by now. It must be quite unique, very different, something that totally changes the meaning of traditional Pav Bhaji, I pondered and then this idea struck me. I had relished this Pav Bhaji in Mumbai, quite recently, when I was visiting my in-laws. I discovered how this variant of Pav Bhaji had struck the cords with Mumbaikars and captured their fascination. While, this Pav Bhaji is not as popular as the usual red-colored ones, but the Black Pav Bhaji had begun to make ground for itself. I had loved its taste and the concept of black pav Bhaji and this was a perfect fit for the contest. 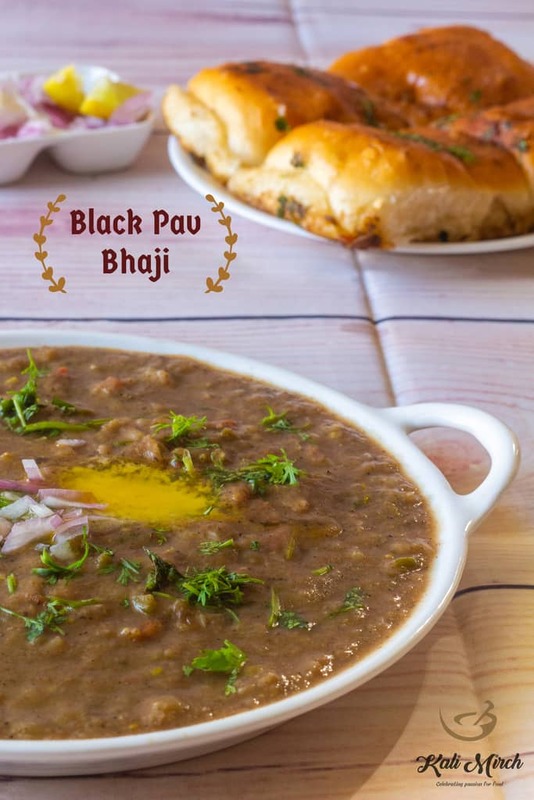 All the readings that I had done about the black Pav Bhaji when I discovered it came to my help and with all this information I was able to replicate the Mumbaiya-ishtyle Kali Pav Bhaji. I must admit, while everyone who I served this unique Pav Bhaji were surprised at the concept of Pav Bhaji going black, what seemed to please them more was the taste factor. Make this unique and flavorful Pav Bhaji for your family and friends and I am pretty sure you will end up attracting many rave reviews from them. Do remember to share your feedback with me in the comment section below. We will start with pressure cooking the veggies-Cauliflower, Potatoes, Green Peas. Add enough water and add some Salt. Pressure cook on medium heat. Meanwhile, grind Green Chilies, Ginger and Garlic into fine paste. We have pressure cooked for about 8 mins on medium heat. Turn off the heat and allow the pressure to release naturally. We will dry roast spices in a Pan. Heat a Pan and put spices in it- Bay Leaf, Mace, Star Anise, Fennel Seeds, Coriander Seeds, Niger Seeds. Add White Sesame Seeds, Cumin Seeds, Black Cumin Seeds, Clove, Peppercorns, Dried Lichens,Cinnamon Stick. Crack open Black Cardamom before adding it to Pan. Dry roast all these spices on low-medium heat. We have roasted spices for 3 mins. Now, add Poppy Seeds and Dry Mango Powder. Roast for another 30-40 secs and remove from heat. Now let's roast dry Coconut on open flame until it becomes lightly charred. Chop roasted Coconut and put it in a grinder jar. Add roasted spices. Grind into fine powder. Do not add water. We have mashed the cooked veggies. Reserve its stock. Heat 2-tbsp Cooking Oil in a Pan. Add 2-tbsp Butter and let it melt completely. Add chopped Onions and cook until it becomes soft. After 4-5 mins of cooking, add green masala paste and cook for 2-3 mins. After 3 mins of cooking, add chopped Capsicum. Cook for another 2-3 mins. After 2-3 mins of cooking, add chopped Tomatoes, chopped Coriander leaves. Add some Salt for softening the tomatoes. We must cook until tomatoes become completely mushy. Cover and Cook on low heat. We have cooked tomatoes for 8-10 mins on low heat and it has become soft and mushy now. Mash with a Potato masher. Add 3-tbsp Kala Masala and mix well. If Masala becomes dry while cooking, add some water in it and cook. Add some butter and cook. We have cooked Masala for 6-7 mins and you can see Oil oozing out on surface. Now, add mashed veggies and give it a nice mix. Add Water to adjust the consistency of Bhaji. I have added 1.5 Cups of water. Let the Bhaji simmer on high heat. Add Salt to taste. Lower the heat and cook covered. We have cooked Bhaji for about 5 mins on low heat. Remove from heat and let's prepare Pav for serving. Serve Pav Bhaji while it's hot.